HAVANA, April 18. /TASS/. 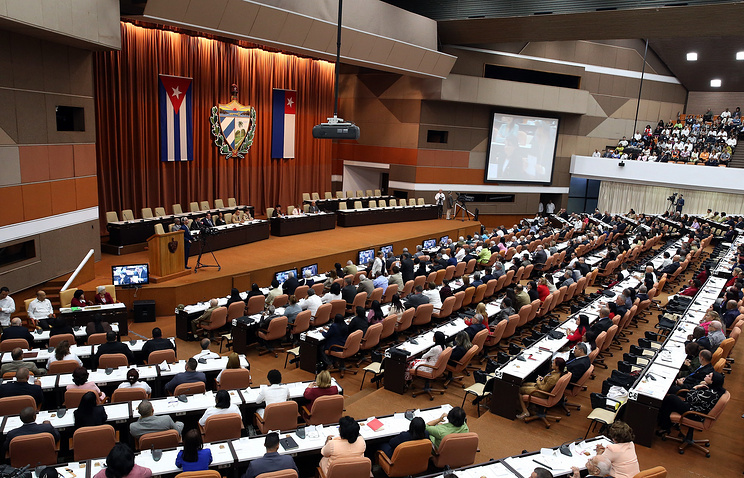 Cuba’s new National Assembly (single-house parliament) has gathered for its first session at Havana’s Palace of Congresses for electing a successor of the current president of the country’s State Council, Raul Castro. The session is being telecast live. No foreign correspondents, except for photographers and TV cameramen, have been allowed to attend. The session will last for two days. On Wednesday, the legislators will elect the legislature’s leadership and then, the president, first deputy president and another 29 members of the State Council. Under the Cuban Constitution, the president of the State Council is the head of state and government. The State Council’s makeup and the name of the new head of state will be announced on Thursday. Raul Castro has led the State Council since 2008, when he replaced his elder brother, leader of the Cuban revolution Fidel Castro (1926-2016). Raul Castro, 86, has said more than once he has no intention of seeking a third five-year term. Observers are unanimous the first deputy president of the State Council and Council of Ministers, Miguel Diaz-Canel, 57 (number two in Cuba’s power hierarchy) is slated for the highest post. At the same time, it is expected that Raul Castro will remain the leader of Cuba’s Communist Party - the country’s sole official political party - at least till 2021. Raul Castro in March was elected a member of parliament once again. He is attending the ongoing parliamentary session.